Situated inside of the New World Center amidst images of up and coming entrepreneurial leaders being projected onto the walls, twenty entrepreneurs gathered to celebrate the last eight months of their entrepreneurial journeys. Joined by over 200 members of the startup community, this finale event marked the completion of the second year of the Miami WIN Lab accelerator program. After 8 months, 40 content sessions, 6 formal presentations, 5 events, and more one-minute pitches than many would be willing to count, each of these WIN Lab entrepreneurs took to the mic to deliver the message of the ventures that they're currently scaling. From connecting families through storybook reading to a straw that detects the most common date rate drugs, these are the female founders of today. Three WINners were asked to take the stage at the New World Center to compete for a share of $8,000 in cash prizes. Chosen from the group of twenty based on their final round of presentations and community engagement with other entrepreneurs in the Lab, the finalists included Imalac, Luxe Fete Social , and Lean Orb. Each venture and corresponding founders had five minutes to present their companies to an esteemed panel of judges including Carol Faber, Partner, Akerman; Magsie Leborngne, Owner, Country French and Babson Alum; and Enrique Garza, Territory Manager, Google Cloud. The three entrepreneurs each walked away with a check to utilize in the growth of their companies. In first place, Imalac a nursing and pumping bra with a detachable massage system which simulates hand expression, won a grand prize of $5,000. Second place and $2,500 went to Luxe Fete Social, the company that empowers anyone to throw a powerful dinner party. And taking home third place was Lean Orb, creating environmentally responsible, plant-based packaging. Miss the event? Head here to see all of the entrepreneurs who participated in this year's Miami program. You can also get a glimpse of the evening by checking out the photography here. Interested in joining the 2018-2019 WIN Lab Miami cohort? Head here to find out more about the program. Applications are open until May 31. Maxeme Tuchman, Co-Founder & CEO of Caribu, and Anastasia Mikhalochkina, Founder & CEO of Lean Orb, were finalists at the IDB Demand Solutions at Miami Dade College joining two WIN Lab alumni. WIN Lab had 4 companies represented out of 18. Anastasia Mikhalochkina, Founder & CEO of Lean Orb signed the Cambridge Innovation Center (CIC) as corporate client. She was also featured in the Miami Herald article: Four ways Miami startups are trying to save the planet. Leyanis Diaz, Founder of Major Marketplace won the American Entrepreneurship Award. 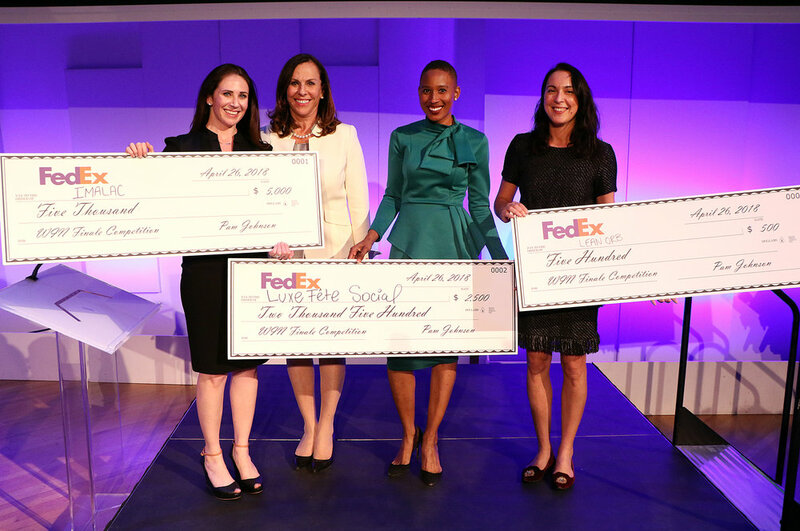 Maxeme Tuchman, Co-Founder & CEO of Caribu, was named the Women In the World's 2017 Toyota Mother of Invention, an honor granted to remarkable women that actively contribute to their community & the world through innovation, entrepreneurship & invention. She will also be featured in a Toyota commercial. Maxeme Tuchman, Co-Founder & CEO of Caribu won the Regional 1776 Cup Competition and WIN Lab Demo Night pitch. She was also included in the Global EdTech Investments and Outlook: 10 EdTech Companies You Should Know About @ Forbes. Founders of Smart Straws, won Fan Favorite at the WIN Lab Demo Night pitch and will be featured at WIT (Women, Innovation & Technology) track at the upcoming eMerge. WIN Lab Companies SpeechMED and Caribu named to Platform’s 2018 South Florida Startups to Watch. Maxeme Tuchman, Co-Founder & CEO of Caribu, beat out thousands of competitors from across the world to take home first prize in the 1776 Global Finals Challenge Cup Competition. She was awarded the top prize of $100,000 from Steve Case’s Revolution Fund. Maxeme Tuchman, Co-Founder & CEO of Caribu took the stage at the 2018 Women of the World Summit in NYC as the winner of Toyota’s 2017 Mother of Invention. Headliners of the Summit include Hilary Clinton and Viola Davis among many other successful women. Current WIN Lab participants Caribu, Lean Orb, and Luxe Fete Social, and WIN Lab alumna Spacewolff named to 10 Startups to Watch in the Miami Herald's article, Where do we go from here? Miami's tech leaders say city needs next startup vision. Nathalie Cadet-James of Luxe Fete Social and Leyanis Diaz of Major Marketplace named as finalists in the 2018 Miami Herald Business Plan Challenge. Ana Maria Carrano of Voyz.es won second place for the Miami Dade College Innovation Prize from the Veronica and Gaston Taratuta Foundation, taking home a prize of $15,000. The competition awards entrepreneurs in the Miami Area who have innovative business solutions. Leyanis Diaz of Major Marketplace was among the finalists.